Kate Lechmere, Cuthbert Hamilton (seated), Edward Wadsworth and Wyndham Lewis at the Rebel Art Centre, March 1914. While Lewis is generally seen as the central figure in the movement, it has been suggested that this was more due to his contacts and ability as a self-publicist and polemicist than the quality of his works. A 1956 exhibition at the Tate Gallery was called Wyndham Lewis and Vorticism, highlighting his prominent place in the movement. This angered other members of the group. 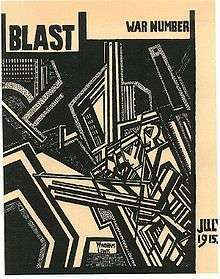 Bomberg and Roberts (who published a series of "Vortex Pamphlets" on the matter) both protested strongly the assertion of Lewis, which was printed in the exhibition catalogue: "Vorticism, in fact, was what I, personally, did, and said, at a certain period." 1 2 "Vorticism", Msn Encarta Retrieved 17 October 2009 Archived May 22, 2007, at the Wayback Machine. 1 2 "From Vortex to Vorticism: Ezra Pound's art and science. | Goliath Business News". Goliath.ecnext.com. Retrieved 2010-11-16. Antcliffe, Mark, and Green, Vivien (eds.). The Vorticists. Tate Publishing, 2010. Cork, Richard. Vorticism and Abstract Art in the First Machine Age (two volumes). University of California Press, 1976. ISBN 0-520-03154-7 & ISBN 0-520-03269-1. Haycock, David Boyd. A Crisis of Brilliance: Five Young British Artists and the Great War. Old Street Publishing, 2009. Pound, Ezra. "Vorticism" in Fortnightly Review 96, no. 573:461–471, 1914. 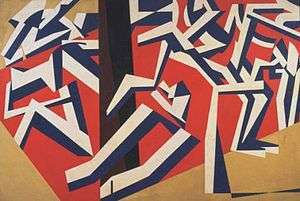 A review of the 2011 Vorticism exhibit at the Tate Britain by Prof. Andrew Thacker.